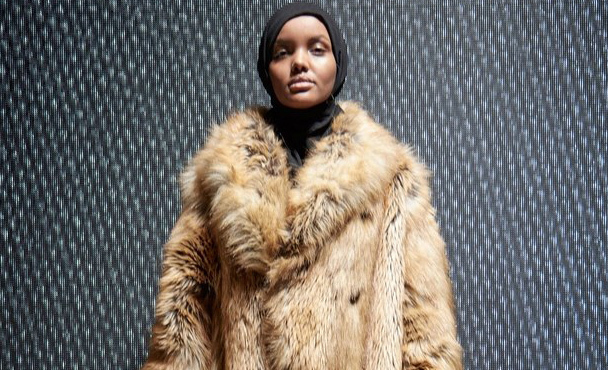 Spotted: Hijab at Yeezy Season 5! Every NYFW, showgoers wait with bated breath to see what spectacles the inimitable Kanye West has in store. His Yeezy Season fashion shows of the past have been noteworthy, to say the least ; fainting models, delayed show starts, inaccessible and downright perplexing runway locations -- these are only a few of the antics that colour Yeezy collections year after year. But in a refreshing change of pace, Kanye chose to take things back a considerable notch with Yeezy Season 5. The show was subtle -- understated, even! -- but made headlines nonetheless, even amidst all the other NYFW hullaballoo. A large part of this can be attributed to Halima Aden, the 19 year old Muslim American who walked the Yeezy runway while wearing a hijab. Chance are, you recognize Halima; she first made news in 2016 for being the first to don a hijab and burkina during the Miss USA Minnesota pageant. Since then, she's found success as a model, signing with one of the largest agencies in the world, IMG Models (also home to Ashley Graham, Gisele Büncheden, and Chanel Iman, to name a few). She was also featured in Caroline Rotfield's CR Fashion Book, in which she was photographed by Mario Sorrentini and touted as "a breakout star". Halima herself commented via Instagram that she was excited to "spread the message that diversity IS beauty!"